The Dunestone trail is located in the Klonzo Mountain Biking Area north of Moab, Utah. 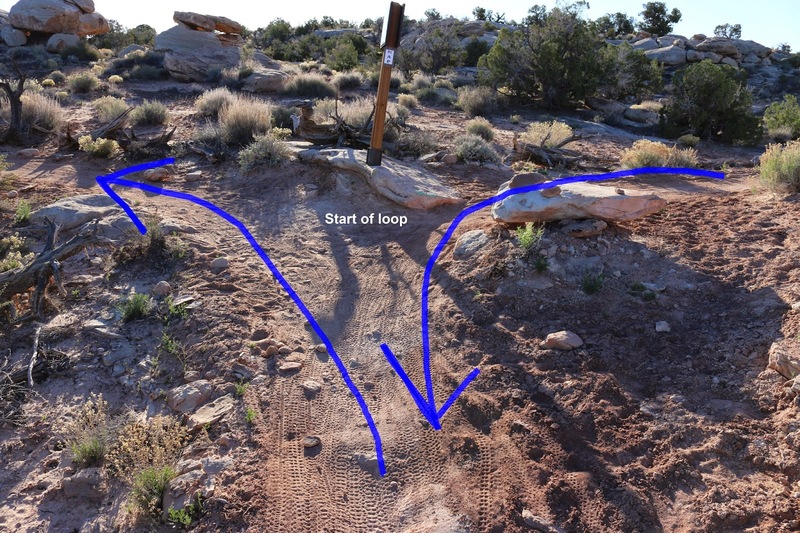 The trail loops around a small mesa traveling across Navajo sandstone as it goes. Many people refer to the Navajo sandstone formation as a petrified sanddune making dune-stone a fitting play on words. The Klonzo trails were built primarily for mountain bikers but they also seem to get a lot of use from hikers and trail runners. To get to the trailhead drive about 12 miles north of Moab, or 18 miles south from the Crescent Junction exit of Interstate 70, and turn east on the Willow Springs Road. Follow the dirt road for about 2.7 miles paying attention to the signs that direct traffic to the Klonzo area. The road passes through a big sandy wash that might require a 4-wheel drive at times. If you have to stop in the wash it is easy to get stuck in the loose sand. Passenger cars can find a place to park before the wash and begin from there. From the trailhead there is an initial climb to get up on the small mesa that the trail loops around. Once on the mesa the trail follows the rim above the trailhead before turning more northward where it comes to the first of two junctions with the Boondocks trail near the quarter mile point. After the initial climb from the parking area the Dunestone trail continues across what is mostly broken slickrock interspersed with shallow patches of dirt. At the 0.46 mile point the trail begins a loop. For this post we followed the left fork and rode the loop in the clockwise direction. For the next stretch the trail follows along the rim of the hill where the Boondocks trail is completing its loop below. Another connector that runs down to the Boondocks trail comes up at the 0.82 mile point. After passing the Boondocks junction the trail begins looping around toward the east over similar terrain as before. As the trail continues arcing its way around the loop it comes to another short connector at the 1 mile point that runs over to the Cross Canyon trail. From that junction the trail continues around the top of the small mesa where the views of the distant cliffs provide a pleasing backdrop to the trail. The loop comes to an end near the 1.5 mile point of the trail. From the close of the loop it is mostly downhill back to the trailhead. On the trip back we jumped off onto the Boondocks trail and completed it. Once back at the trailhead we completed the rest of the trails in the North Klonzo section before calling it a day. 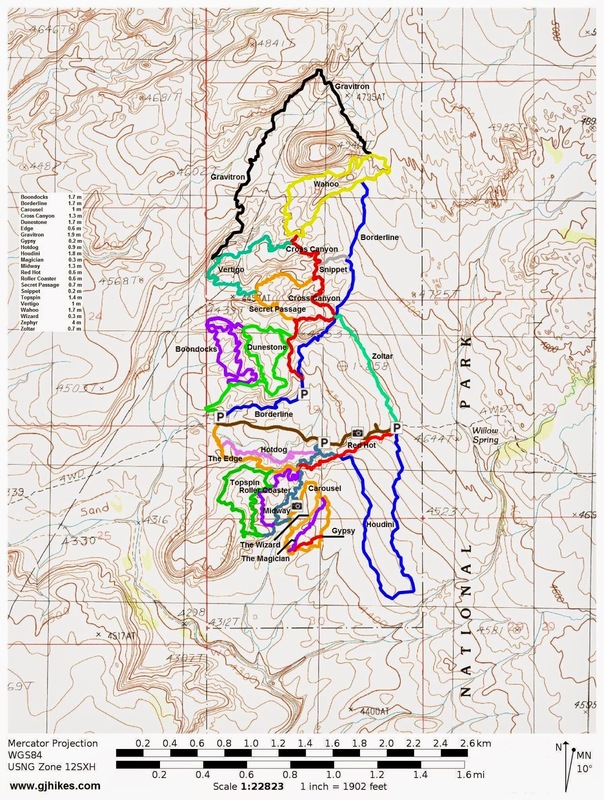 The North and South Klonzo areas are about evenly split as far as the number of trails goes. For the Dunestone trail, if you would like to see it for yourself then all you have to do is grab your bike or 'Take a hike'.